Where the mind and SharePoint sometimes meet. SharePoint 2010 Error with Performance Point Dashboard: The data source no longer exists or you do not have permissions to view it. Additional details have been logged for your administrator. While using Performance Point’s Dashboard Designer, I received the following error. The data source no longer exists or you do not have permissions to view it. Additional details have been logged for your administrator. Error Message: The data source no longer exists or you do not have permissions to view it. Additional details have been logged for your administrator. Contact the administrator for more details. Exception Message: The data source no longer exists or you do not have permissions to view it. Additional details have been logged for your administrator. 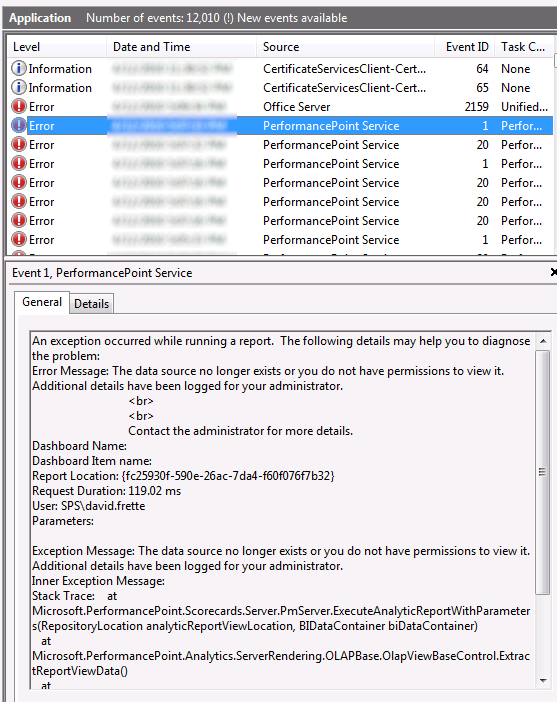 PerformancePoint Services error code 20604. 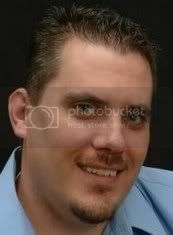 I solved this issue by adding my user account to the visitors group of the site. Crazy! Coming Soon: Performance Testing of Adding Unique terms. The results may surprise you. I have been prepping for my Soup to Nuts: The Managed Metadata Service presentation that I’ll be delivering at SharePoint Saturday – Atlanta (4/17), amongst a few others to be mentioned later. So I wanted to run some stress testing. Granted, I’m running in a developer environment, but that won’t undermine the point of the tests. I had a hypothesis that after ~ 10,000 terms are added, performance takes a hit. The results show that the hit was worse than I had thought. The first 10,000 terms were added in 1 minute (technically 50 seconds). So 500k would be 50 minutes (linear extrapolation). I suspected the hit would be 2x to 3x. Instead, it took about 370 minutes for 500k terms, a factor of more than 7x. At no point in my test did RAM hit the max available or CPU top out at 100%. These are NON-unique terms. Each termset has the exact same terms. Another post is coming on using unique terms. Below is the output from my code, which I’ll post later. Microsoft released some exam information on SharePoint 2010, but only for developers. ITPros, I guess you’re going to have to wait. Check out the Training Page – at the bottom you’ll see an exam list. For IT Pros, Exams Exam 70-667, 70-668 don’t have pages. Get ready for SharePoint 2010. The news is official now. Available for businesses on May 12, 2010. Available for everyone else in June 2010. I created a new Visual Studio project and entered in the url of a site that simply didn’t exist. Whoops! I didn’t want to create a new site for just this project, so I wanted to change the URL that Visual Studio 2010 uses to deploy this SharePoint solution. It’s not located in the project file itself. It’s located in the user config file of the project. Once this file is open, you can change the url, save the file, and close it out. After editing this file, you’ll have to reload your project. It’s not completely obvious where this setting is, but once you’ve done it, you’ll remember that the key is the user configuration file. I found some outdated information for the SharePoint snap-in for PowerShell. The cmdlet to enable and disable the developer dashboard has been deprecated. To use powershell, we ultimately need to use the Object Model. To view the answer, just scroll to the bottom! Set-SPFarmConfig : A parameter cannot be found that matches parameter name 'DeveloperDashboardEnabled'. Finally, I was told by a certain ADMIN to use the OBJECT MODEL. LOL. He was right, though. 🙂 He’s a good admin and developer wannabe. OK. One more consolidation. Use this single command to set the developer dashboard. It’s very long, so I suggest copy and paste. I had to include RETURN breaks as it scrolled off the page. 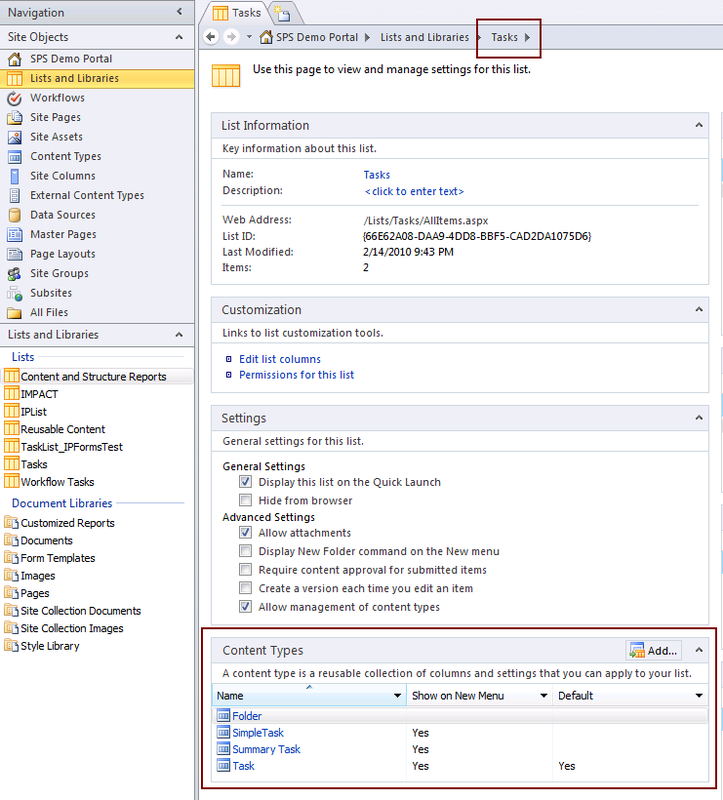 Meeting unique validation requirements for content types in the same list. We can create seperate forms for each content type using InfoPath. It’s pretty easy. 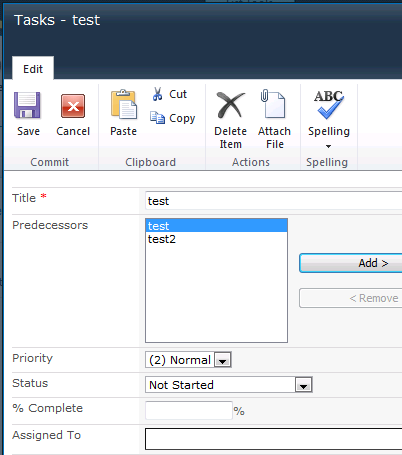 However, you cannot customize New/Edit/View forms with InfoPath. You can, however, use SPD and ListView WebPart. That will be the topic for another post. So, first I’ve set up my Tasks list to have an extra content type (ignore the summary task – I will). I have the Task content type, which is out-of-the-box. 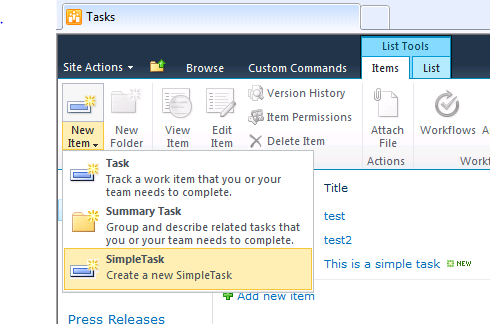 I also have a Simple Task content type, which has Task as the parent. I’ve added a new field, called Owner. That’s the only difference. 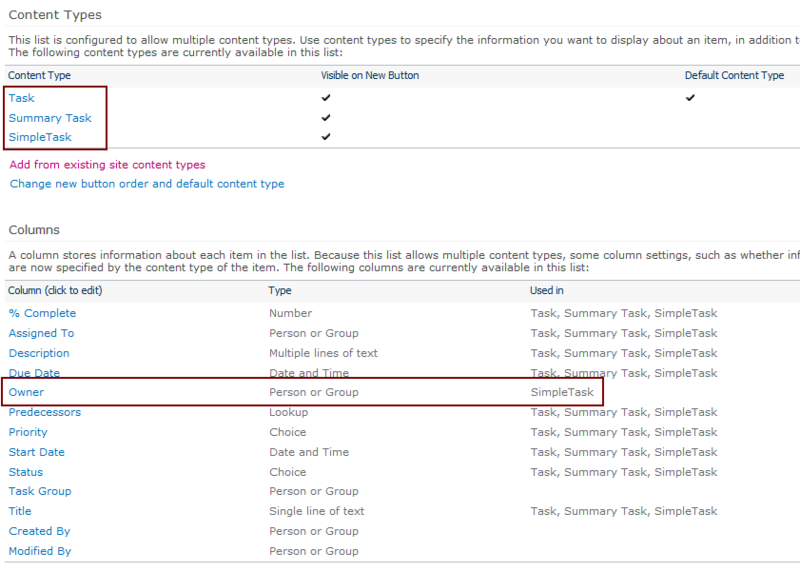 See List Settings from within IE and then from within SPD. 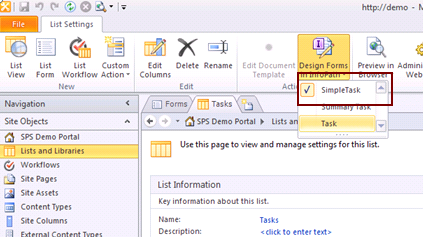 Now go to your Tasks List and click Design Forms in InfoPath. Select the content type you wish to modify. I’ll demo a custom InfoPath form for my SimpleTask content type. Using the InfoPath client Backstage area, found under File tab, the form is published to the list. This message indicates all went well. 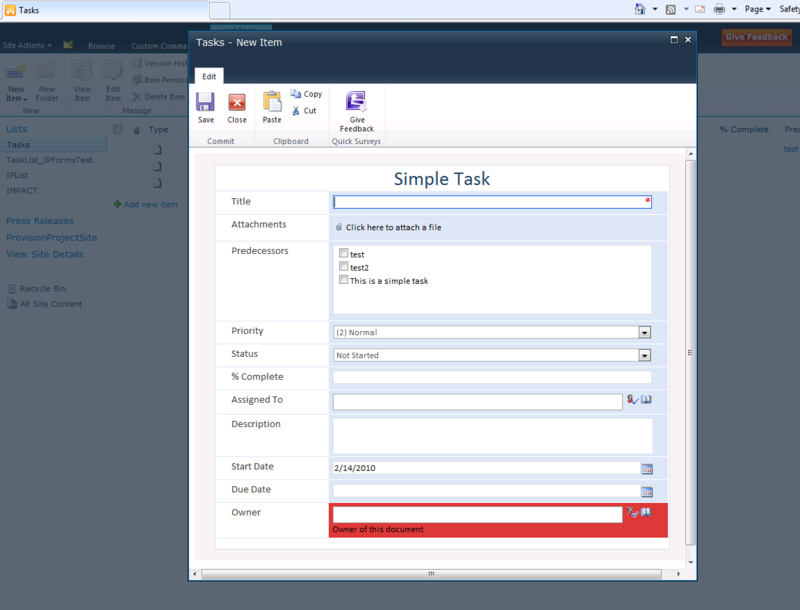 Now, in the web browser, selecting a new SimpleTask from the New Item menu will display the newly customized form. 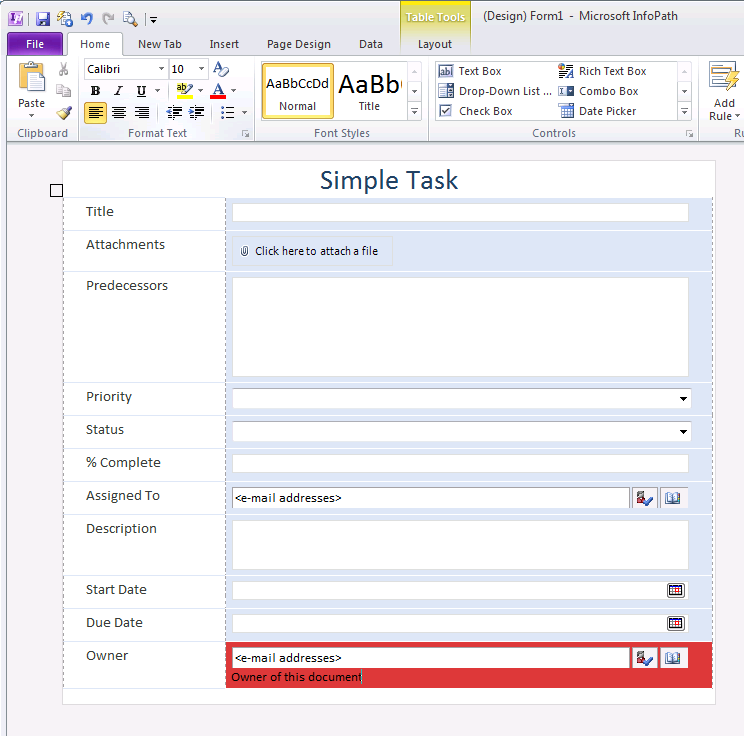 Here is the customized Simple Task content type form. 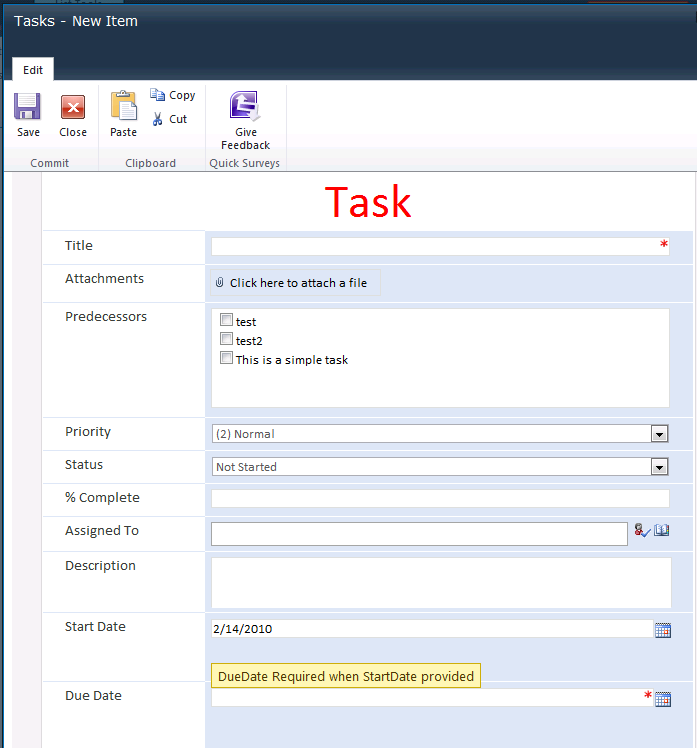 A customized Task form can also be created. 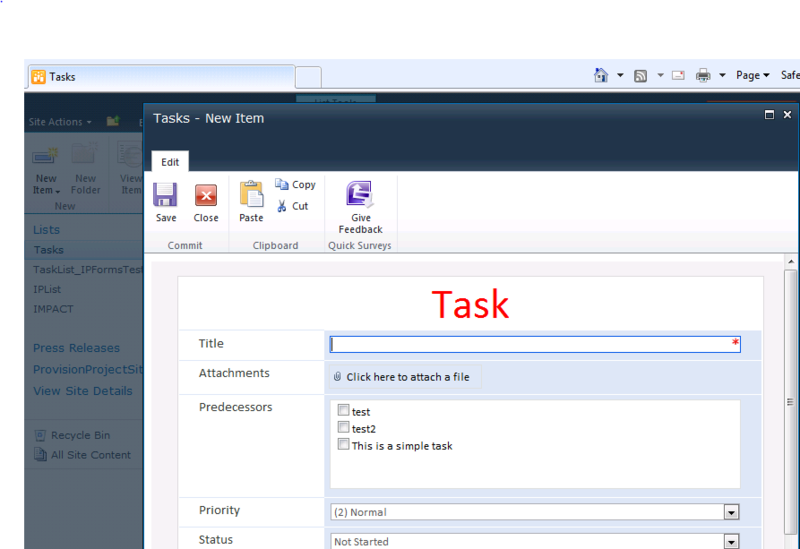 Here is the customized Task content type form. Now let’s make the Task more complicated in validation. 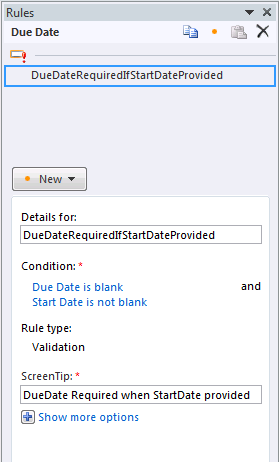 Let’s create a rule that says the “Due Date” is required when a “Start Date” is provided. After publishing the Task form and starting to fill out a new task item, the validation error is revealed. So, in summary, you can have an InfoPath-customized form for each content type. This works well if you need to validate data differently for each content type. Using InfoPath, we can set our own data validation rules. Since each content type can have its own form, each content type can have its own validation rules. If you see this error “Unable to synchronize the project with the SharePoint tasks list due to a circularly-linked task” it is most likely because you linked a task to itself. 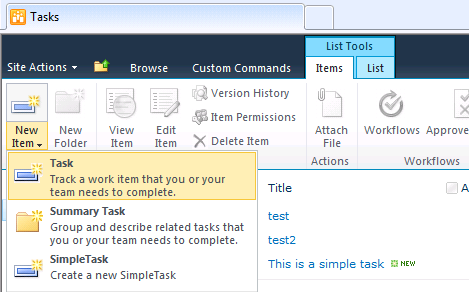 Notice in the task list, the Predecessor is the same as the Title. So, to rid yourself of the error, remove the self-referencing task from the predecessors list, save the item, and go back to Open Schedule to get back into MS Project. Note: See the task item edit form below. The predecessors list allows the selection of itself. This can’t happen in the create form, but it can when you edit an existing one. It would have been nice if Microsoft would have thought of this and changed the form to lookup GUIDs and refrained from using it’s own GUID. Obviously a seperate form form the create form would be needed, but I don’t think that would have been too much for MS to do. Perhaps in the RTM version it will be enhanced. First off, I’m not jumping to conculsions. 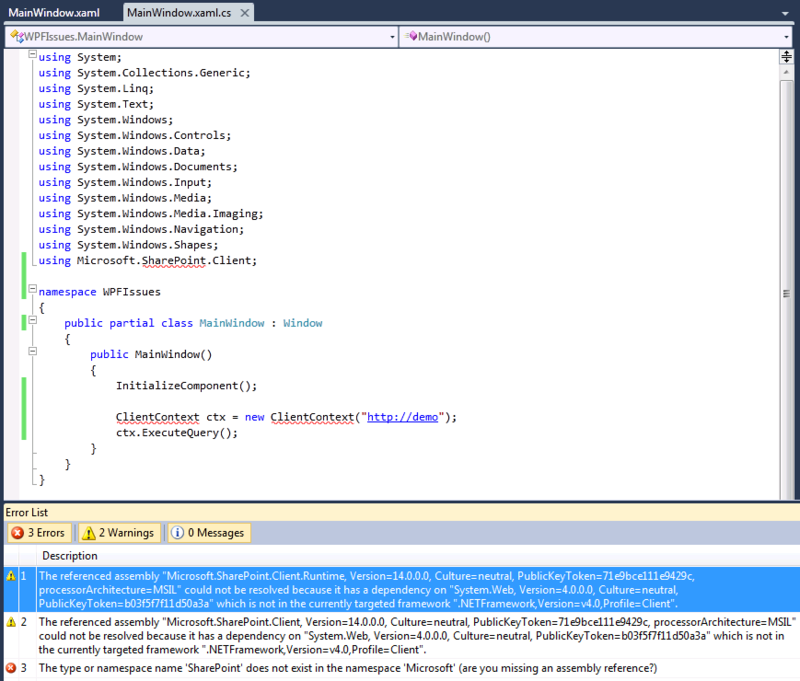 Sometimes WPF will make more sense that SilverLight. 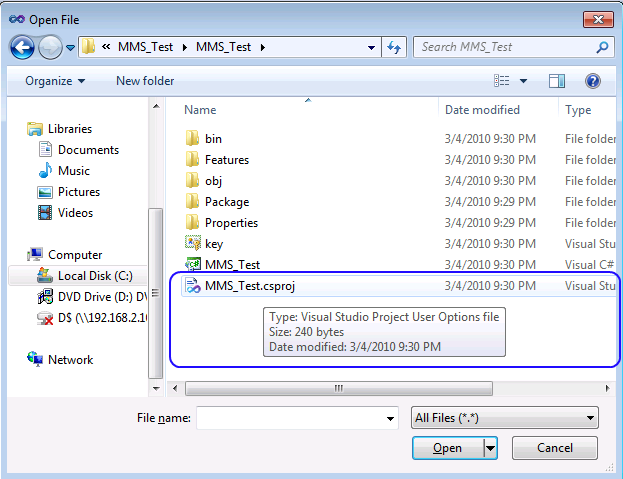 While WPF can run on the server and use the SharePoint DLLs and full OM, it can also be delivered to the desktop. Desktop WPF apps cannot use the SharePoint DLLs. Thus, bring in the SharePoint Client Object Model. 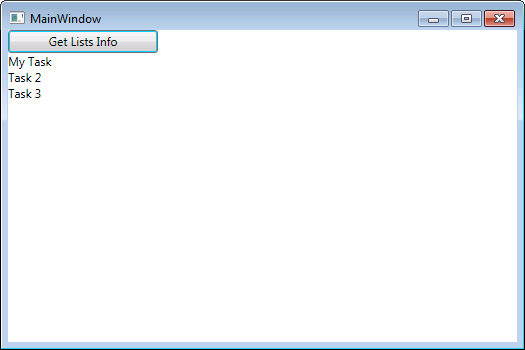 So, you can have Silverlight pretty, but WinForms functionality, all in one. 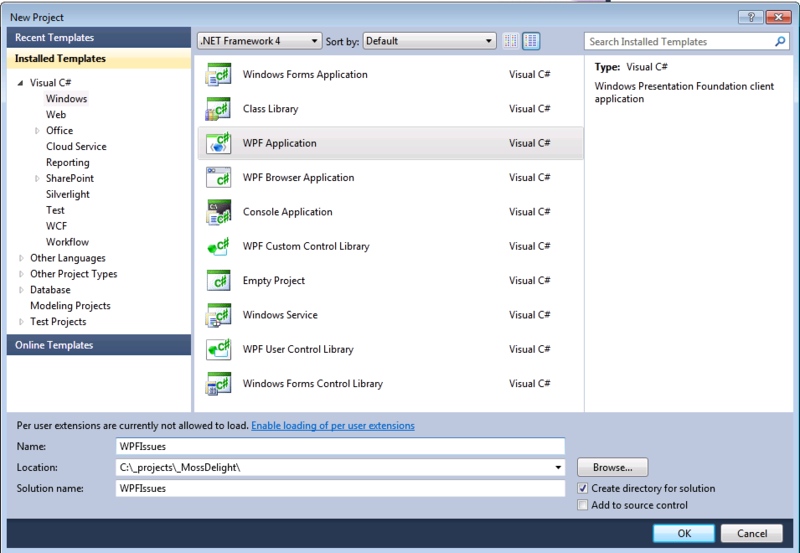 So here are some advantages of using a WPF client. So how about a quick example? Here’s the most basic code. 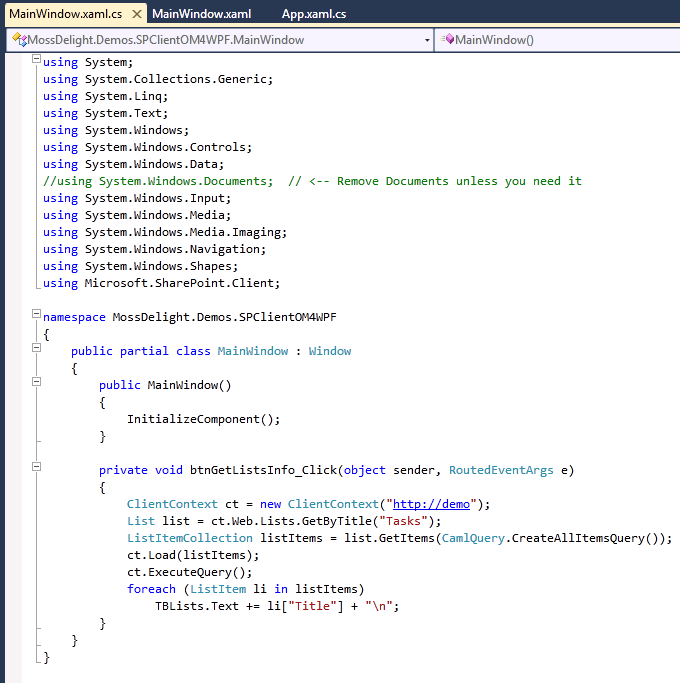 Notice how much less code there is in the WPF example than in the Silverlight example! The referenced assembly “Microsoft.SharePoint.Client.Runtime, Version=14.0.0.0, Culture=neutral, PublicKeyToken=71e9bce111e9429c, processorArchitecture=MSIL” could not be resolved because it has a dependency on “System.Web, Version=4.0.0.0, Culture=neutral, PublicKeyToken=b03f5f7f11d50a3a” which is not in the currently targeted framework “.NETFramework,Version=v4.0,Profile=Client”. Go into the project settings. They are probably set to .NET 4.0 Framework. In order to use the ClientOM, set them the Framework to 3.5. The project will be unloaded and reloaded, so be sure to save your work before going into the properties canvas. 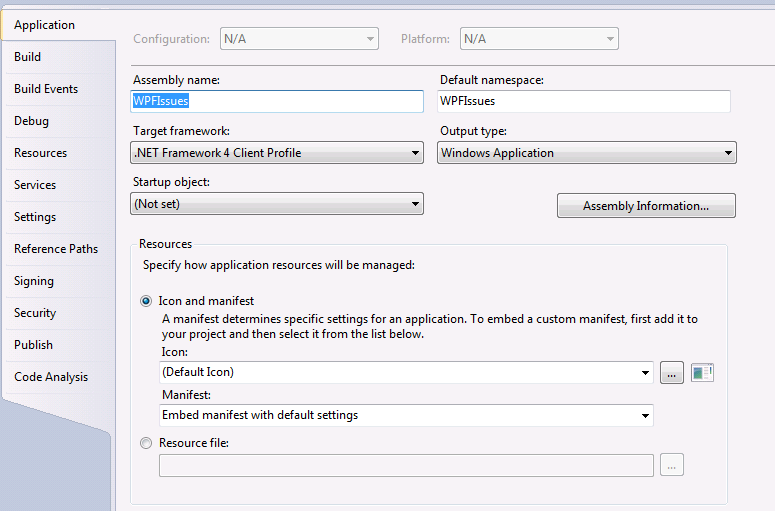 Next time you build an application intending to use the ClientOM, set the .NET Framework to 3.5 when creating the project.